The North Face Cobra 60L backpack is what you need if you’re planning an alpine expedition to some far off snowy peak, hidden from the rest of the world. This backpack by North Face is specially designed for alpine expeditions and provides a wide range of convenient features that make this the ideal backpack for mountaineering. The Cobra 60 backpack is a full featured alpine backpack that comes with ice tools and crampon storage combined with an ergonomic aluminum frame which makes it very easy to carry large loads. The Cobra 60 is quickly becoming one of the most popular alpine backpacks in the market thanks to the superior quality and high functionality the pack provides. 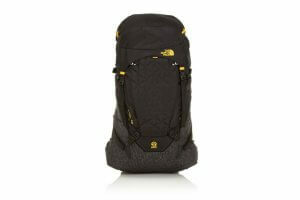 North Face is a legendary name when it comes to world of hiking and mountaineering. Named after one of the harshest and coldest part of a mountain, North Face has helped several explorers reach the most unfathomable heights in the Himalayan range. The company was founded in the year 1966 in San Francisco and has ever since grown to become one of the largest names in the market for hiking and travel gear. Today this company delivers a wide range of high quality products which include apparel, equipment, footwear and more. Thinking North Face? … Get it on sale here. The North Face Cobra 60L is the perfect backpack for you if a highly technical pack for alpine ascents is what you’re looking for. It gives you plenty of space to store all you need on an adventure and even comes with convenient features such as a floating lid, crampon pockets, tool keepers and a lot more. The pack has tons of removable features and parts that you can easily detach from the backpack to make it much lighter whenever you need it. Coming to the features of the Cobra 60L backpack by North Face, it is packed with a ton of performance boosting features that make your adventures a lot safer and easier. Apart from the spacious main compartment, it also features a flip forward lid that can be used for storing small items such as snacks and other quick access items. You also get a hydration sleeve along with the backpack which can be very convenient during treks as it allows easy access to water within your arms reach. However, you will have to purchase a hydration reservoir separately which then has to be installed into the port. The backpack is made from high quality 420D Cordura Nylon and 500D nylon which is among the sturdiest of materials used in manufacturing hiking backpacks. North Face puts great emphasis towards producing hiking gear that are extremely durable and the Cobra 60L backpack is no different. This brand is widely known for producing some of the toughest backpacks in the market, passing every product through several levels of scrutiny before being handed over to the customers. The material used for producing this particular backpack is puncture resistant and waterproof. It is guaranteed to withstand the harshest of the climates and come out without a scratch. If taken care of as per the instructions provided by the company, you can easily make this backpack last for a lifetime. The Cobra 60L being an alpine expedition oriented backpack has some very essential features and utilities that come in very handy during icy treks. It features a stowable helmet carrier, sled drag clips and ski carry systems that will ensure your icy adventures are both fun and safe. You also get an easy access ice axe hold on top of the pack which allows you to keep things compact during tight situations. Keeping your equipment and other items organized gets much easier with the Cobra 60L hiking backpack. The sleek covered-tip tool storage area, external wand pockets, and a slot of store rope carriers make it extremely convenient and easy to keep your gear in place. Apart from all those, you also get features such as a hipbelt pocket, reflective hits, tool loops and lash points; all designed to make your journey enjoyable. As far as the comfort of the Cobra 60L backpack is concerned, be assured that there is no other alpine backpack in the market that gives you such a high level of comfort. It has fully adjustable shoulder straps that are padded thickly thus reducing strain on your shoulders. The padding on the hip belt is made of EVA foam which absorbs a large percentage of the force, keeping your lower back safe from injuries. Overall, the North Face Cobra 60L backpack is among the finest you can get in the market when it comes to alpine specific hiking expeditions. With a total volume of 60L, you can store all your gear in one place and not have to worry about leaving anything behind. This is highly recommended for all those hiking enthusiasts that are planning an icy trek anytime soon.